Dublin-born Steve was spotted playing for non-League Skelmersdale United and signed for Liverpool in May 1970 when he was 22 years old. Like his team-mate Brian Hall, Steve was a University graduate (with a degree in Economics) and therefore had a very different background to most professional sportsmen of the time. The club had a fairly settled side at the start of the 1970-71 season as Bill Shankly continued his rebuilding programme in the wake of the dreadful F.A. 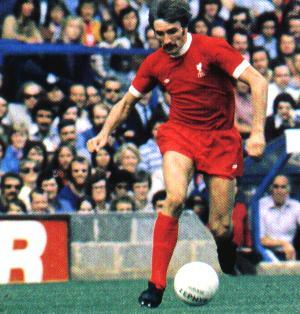 cup defeat at Second Division Watford at the start of the decade but a freak accident in the home match with Chelsea early in October was the start of a long run of success for Heighway as a Liverpool player for the rest of the 1970's and into the 80's. Bobby Graham's broken leg (which effectively ended his Liverpool career) saw Steve replace him from the substitute's bench and when the starting line-up for the next League match (away to Tottenham) was announced, his long run in the side would start for good. He had an unorthodox style and that and his pace caused many a problem for defenders during his debut season. He turned one of the most memorable 'derby' matches in history in November 1970 when with Liverpool two goals down to the defending champions at Anfield he received the ball out on the left-wing after a raking pass from Tommy Smith. Side-stepping John Hurst's attempt to cut him in half, he made his way into the penalty-area and, with everyone expecting a cross, squeezed the ball past Andy Rankin at the near post. Seven minutes later his pin-point cross from the left landed on John Toshack's head and Liverpool were level. Chris Lawler scored the winner for the Reds a few minutes from time. The statistics of matches and goals at the top is included in the table by the conducted player of a reserve in a seasons 1970-71, 1973-74,, 1977-78 not completely. Shankly's young side reached the F.A. cup final that season and Steve scored a similar goal past Bob Wilson but despite taking the lead, Liverpool suffered the heartbreak of an extra-time defeat to Arsenal. Like a number of his colleagues that day, Steve would return to Wembley three years later as a winner and again he scored (this time against Newcastle). 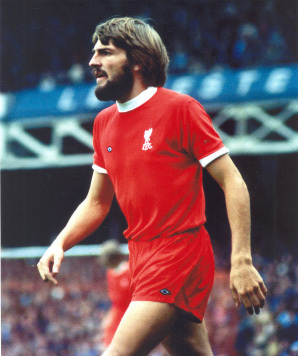 By then he was an established and important member of the side and had many caps as a regular international with the Republic of Ireland to add to the championship and UEFA cup medals he had won with Liverpool in 1973. Steve was never a prolific scorer (the highest number of goals he managed in a League season was the 9 he got in 1974-75) but he created numerous openings for players like Keegan & Toshack and later on for the likes of Dalglish, Johnson & Fairclough. Steve added another UEFA cup winners' medal in 1976 before being part of the team that won the greatest prize of all in Rome in 1977 and he added a 2nd European cup winners' medal a year later when he came on for Jimmy Case against Bruges at Wembley. He couldn't be absolutely sure of his place after that but still made 26 League appearances in 1978-79 as he collected the 4th of his First Division championship medals. He was hardly called on at all during the next two years and made a decision to leave England and try his luck with Minnesota in the United States after playing nearly 450 first-team matches in all competitions for Liverpool. It was not a happy time for the popular Irishman who was affected by severe financial problems at his American club. Eventually he returned to England and although his playing-career was at an end, the years of good service he had given Liverpool had not gone un-noticed and he became an employee of the club again, taking over the responsibility of Liverpool's new Academy of Football. 1979 v Wales, Argentina, Belgium; 1980 v Portugal, Sweden, Portugal; 1981 v Israel, Sweden, Northern Ireland, Portugal; 1982 v Spain, Northern Ireland (sub), Wales, England, New Zealand, Brazil, USSR, East Germany, Switzerland, Belgium; 1983 v Switzerland; 1985 v Wales (sub); 1986 v Romania(sub); 1987 v Republic of Ireland (twice), Luxembourg (26). 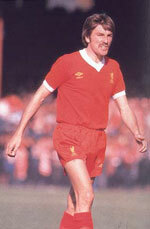 Brian Hall on Steve Heighway: "Steve's a very bright lad academically but he learnt his football trade very quickly. He made an immediate impact when he got into the side and continued for many, many years and that's why he won so many trophies with this football club. Outstanding and at times truly brilliant."